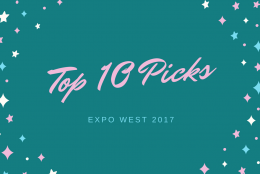 When I met Rose, the founder of Munkijo Organics, at Expo West this year, I was in for a pleasant surprise. With almost 2800 vendors at the show and many of them producing coconut products, it takes a lot to stand out from the crowd. 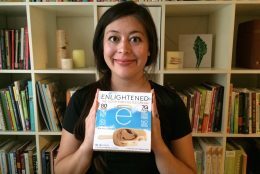 After including Munkijo in my Top 10 Picks of Expo West 2017, I wanted to followup with an interview with Rose to delve into more detail about what makes this brand and their products so special. Rose, you grew up in the Philippines and your family had a coconut farm there. 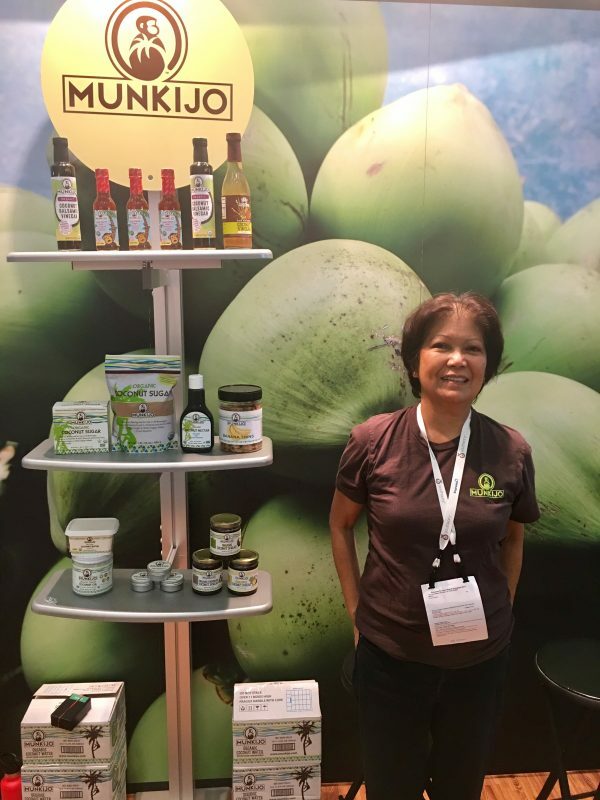 What experiences led you to create Munkijo and all your fabulous coconut products? As a young child, my family and I would spend our holidays and summers at our coconut farm, which was located right next to a beach. During harvest time, which occurred every 45 days on average, I would watch the farmers climb the coconut trees and chop off the bunches of coconuts from each tree and amass the nuts from each tree into a central spot, apparently for pick up by the coconut traders who bought them and in turn sold them to the big coconut processing plants, which were owned by American companies. This is the origin of our brand “Munkijo.” The farmers climbed the tree like monkeys – “Munki” – and they were like regular Joes – “Jo”. That was back in the 1950’s. Today the processing plants are now owned by Filipinos, and they no longer climb the tree to pick the coconuts, but they now use long poles with sharp blades on its edge to cut the bunches of coconuts from the trees. I knew back then that I wanted to be involved in the coconut business, and I learned from immersion and from a beloved uncle that all parts of the coconut are useful. Coconut is a very popular ingredient right now – people are using coconut oil, sugar, and water more than ever before. Can you explain how these three products are made? Do they come from the coconut itself or the tree? Coconut Sugar originates from the blossom of the coconut tree; coconut oil from the meat, and water from the water inside the coconut shell. 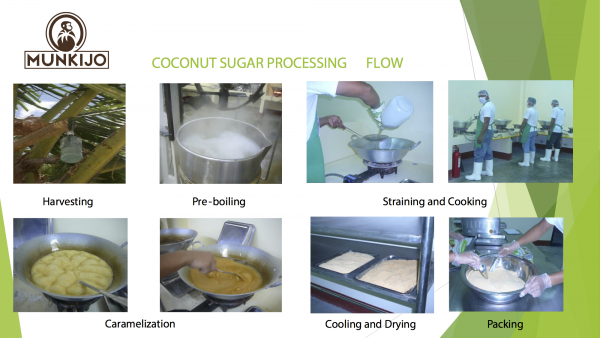 Needless to say, each one of these products contains amazingly healthy nutrients and absolutely provide sustenance for life, earning the name “the tree of life.” Here are the processes involved in producing Munkijo Organic Coconut Sugar and Virgin Coconut Oil. With all the different brands and sources of coconut oil, people are wondering what makes one better than the other. Can you tell us more about what makes your production processes special? No shortcuts are made in producing our healthy products. 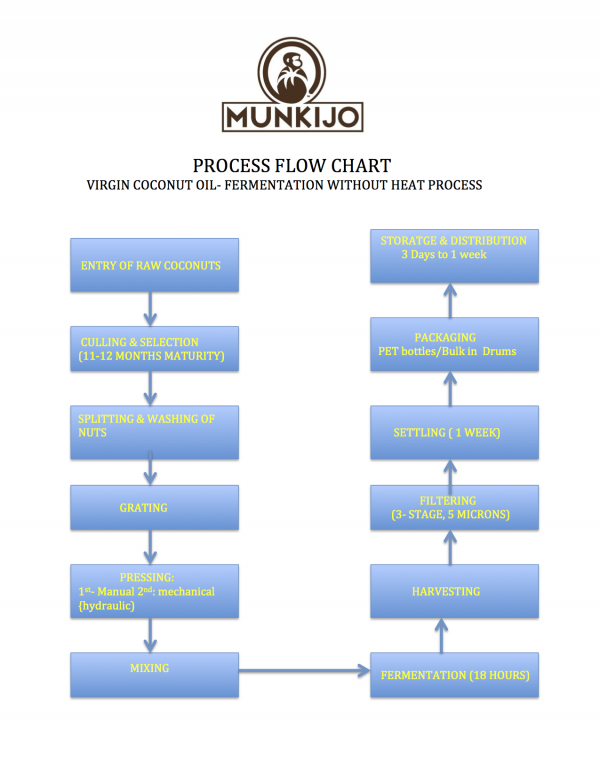 Munkijo Organic Virgin Coconut Oil, for example, is produced using the more expensive method, truly cold-pressed centrifuge processing (ANH “absolutely no heat”) vs. the heat-processed expeller method, where heat is applied so that more oil is extracted from the coconut meat, resulting in a more coconutty aroma and taste. Munkijo Organic Coconut Water is as pure and refreshing as it gets. Once the coconut shell is opened, the water is run through pipes that will pasteurize the water rapidly (only 6 seconds). We gently pasteurize to ensure that there will be no risk of e-coli or bacteria that can infiltrate the water – nothing is added, no preservatives used in our organic coconut water. Some brands are organic, but from concentrate. When you get water from concentrate, some nutrients are lost due to the extensive processing involved. Munkijo Organic Coconut Sugar is guaranteed 100% PURE organic coconut sap. I will venture to say that some coconut sugar brands from other countries may be adulterated with brown or muscovado sugar. You have created a lot of innovative coconut products, like vinegar and hot sauce. Where do you get your inspiration and what do you have up your sleeve? 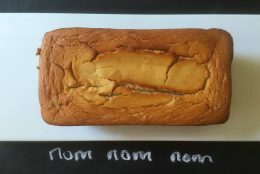 You can expect a lot more delectables from Munkijo. Growing up, we were exposed to the many different kinds of food and snacks containing coconuts. You can expect that Munkijo will be offering more innovative coconut snacks, sauces and dressings that I was exposed to as a child. What else would you like people to know about Munkijo? Munkijo’s roots stem from a dream that never really went away. Immediately after graduation from college, I wanted to be in the coconut business, having had the farm for generations. I am a fourth generation coconut farmer. Back then, in the late 60’s it was a simple dream – sell coconuts to the big processing plants owned mostly by American corporations. I was told “yes, we will buy from you, but you need to deliver it roadside.” Meaning, I would have to take care of trucking, and that alone was a big task for a recent college graduate. So my dream stayed in limbo. Fast forward four decades, which is a really long time. But finally in my 60’s I had the impetus to get back in the groove and start Munkijo, with the aim of (1) helping the hands-on farmers who had stayed with us for generations as well; (2) helping the local and foreign economies that were involved in the sale of Munkijo products; and (3) to continue the legacy of my ancestors in propagating coconuts whose harvest has given a constant livelihood to four generations and provided health to millions of coconut consumers. The take-away from my experience is that you can dream big, and that it is never too late to pursue your dream, no matter what your age. You can learn more about Munkijo on their website and follow them on Instagram, Twitter, and Facebook.